A mystical liquid that cures all ills... or just dirty water? Talk to Sickly Bernice in her Taphouse. Retrieve her antidote from Knotty Bramble. Return the miraculous "cure" to Bernice for your reward. In the southern section of Crucible is an inn, not quite rumored around town for its cleanliness, called Sickly Bernice's Taphouse; its proprietor of course being Sickly Bernice. Talk to her and she'll tell you about her "deathly" condition. Fortunately, she has been graciously told where a cure is located: "A traveler came in one evening and said he would tell me where a cure was located, if I let him stay in one of the rooms for free", she says. After giving you 'Bernice's Empty Flask she'll explain you need to travel to Knotty Bramble and find the pool of water with the Grummite altar in the middle. Here is the aquanostrum, the antidote she seeks. Knotty Bramble is a cave southeast from the Gates of Madness, east of Fellmoor, slightly off Pinnacle Road. It consists of three zones all quite heavily guarded by Grummites. However, the pool of water with the altar is located in the third zone, Knotty Bramble Hatchery, and exploring Knotty Bramble, Lost Crypt is not necessary. Simply wade into the pool towards the statue, and you'll receive a quest update confirming you have the antidote. Make the trip back to New Sheoth and pay a visit to Sickly Bernice. Once you give her the antidote, she'll reward you with the Circlet of Verdure. After a while, if you speak to her again, Bernice will ask for more of the stuff and give you another flask. However, there is no new quest, and there will be no update once you reach the statue again. She will, however, reward you with a leveled amount of gold—up to 450 gold coins. It is possible to receive Bernice's request for another dose before the dungeon respawns. Until it does respawn, her empty flask will not be replaced by one with Aquanostrum. 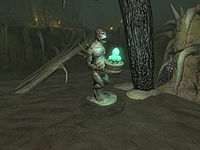 If you return to the statue after completing the quest, you will receive an Aquanostrum flask even if you hadn't collected the empty flask from Bernice. This is marked as a quest item so it cannot be dropped. If you talk to Bernice and agree to help her again you can hand over the full flask only to be stuck with an empty one instead. This bug is fixed by the Unofficial Shivering Isles Patch. You can fix this using the console: enter player.removeitem 0006ea50 will remove the full flask from your inventory; player.removeitem 0006ea4f will remove the empty flask. 5 I've spoken to Sickly Bernice in New Sheoth. It seems she believes she is dying of some horrible malady, and only I can locate the cure. Strangely, she looks well to me, but she promises a reward for the cure's return. Perhaps I should hear her out. 10 Sickly Bernice has told me the cure for her mysterious malady is a sample of water from a pool at the bottom of Knotty Bramble that she calls aquanostrum. She's marked the location on my map. I should make my way there and recover this miraculous antidote. 20 I've entered Knotty Bramble. I should make my way carefully to the pool Sickly Bernice spoke of and recover a sample of aquanostrum. 25 I've arrived at the pool Sickly Bernice described. I should get as close as possible to the statue in its center to gather a sample of the aquanostrum. 30 I've recovered a sample of aquanostrum from the pool Sickly Bernice described. I should return to New Sheoth and present it to her for my well-deserved reward. 100 Finishes quest Sickly Bernice has rewarded me for recovering the cure to her ailment. It is possible to use the console to advance through the quest by entering setstage SE41 stage, where stage is the number of the stage you wish to complete. It is not possible to un-complete (i.e. go back) quest stages. See SetStage for more information.